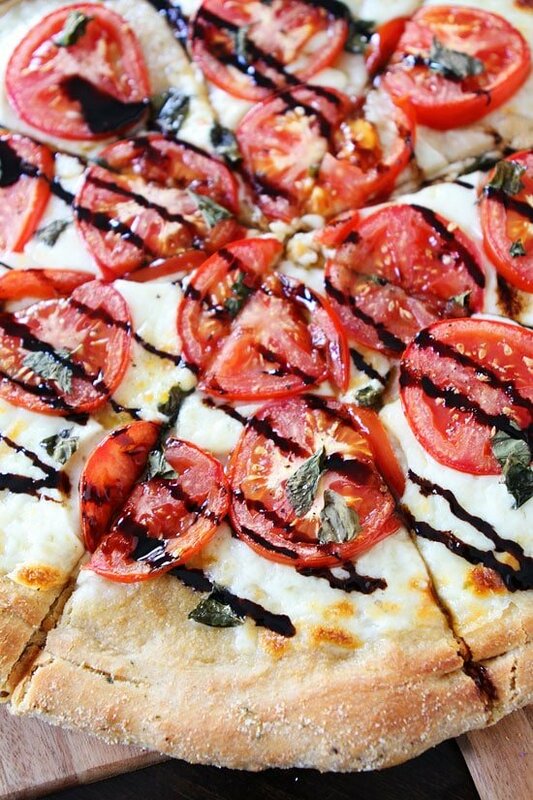 Caprese Pizza-pizza topped with fresh mozzarella, tomatoes, basil and a balsamic glaze. 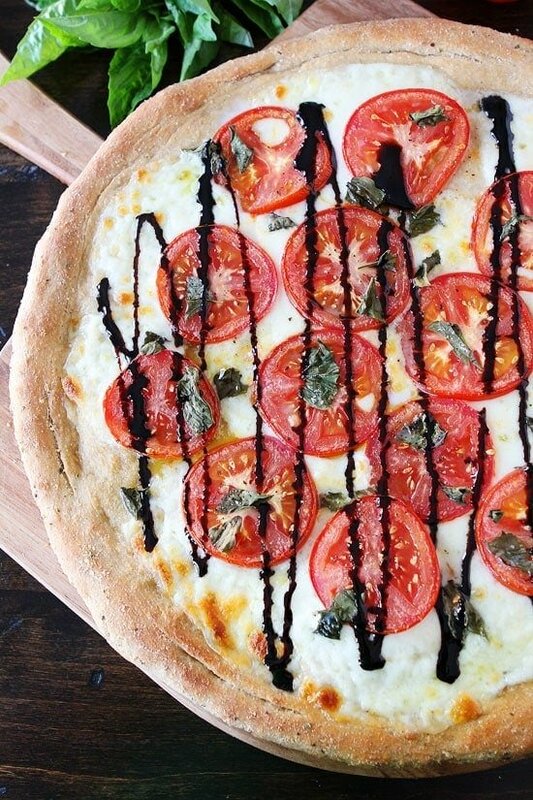 You can’t go wrong with a classic Caprese Pizza! 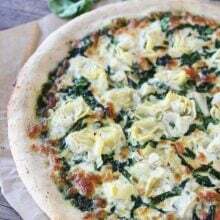 On Wednesday, we shared our favorite Easy Whole Wheat Pizza Dough Recipe and today we are sharing the pizza we made with that special dough. Put your hands up in the air and wave them like you just don’t care for Caprese Pizza! That’s right, let’s get excited because it’s Friday and not just any Friday, but PIZZA FRIDAY! Caprese Pizza is a classic and one of our go to pizza recipes! I could eat Caprese Pizza every day and never get sick of it. Do you still have tomatoes in your garden? We do! I needed to use some up and Caprese Pizza was the answer! This pizza is SO good with fresh garden tomatoes. We also put our garden basil to use! I love eating seasonal! This pizza is a breeze to make. 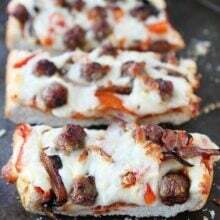 Roll out your pizza dough, I highly recommend you use our Easy Whole Wheat Pizza Dough. If you are in a pinch, you can use store bought dough. 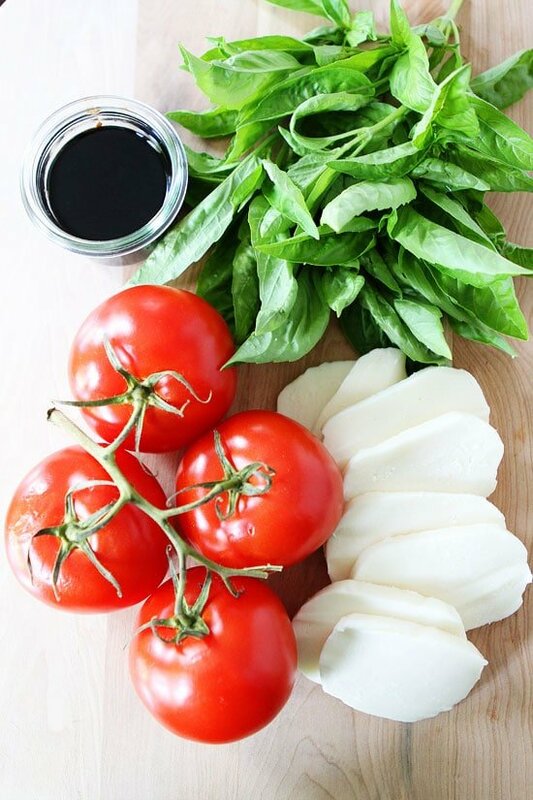 Brush the dough with olive oil and top with fresh mozzarella cheese, tomatoes, and basil. Bake until the crust is golden brown and the cheese is melted. Remove from the oven and drizzle with balsamic glaze. 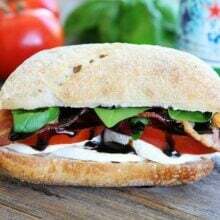 We like to use DeLallo’s Balsamic Glaze. It is the best and super convenient! You can also make a balsamic reduction. Cut the pizza into slices, take a bite, close your eyes, and pretend you are in Italy! The flavors are simple, but SO good! You can’t go wrong with this classic pizza! It hits the spot every time, especially when you use fresh ingredients! 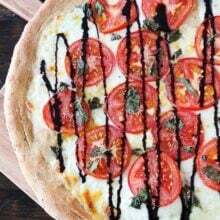 Make tonight pizza night and make our Caprese Pizza! Enjoy! You can't go wrong with this classic pizza! It's a favorite at our house! Preheat oven to 450 degrees F. If using refrigerated pizza dough, remove dough from refrigerator and allow dough to come to room temperature while oven preheats. Place pizza dough on a lightly floured surface. 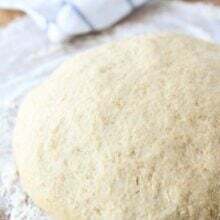 Roll pizza dough out into a circle. Make a thicker crust along edges of pizza. Brush olive oil evenly over the dough. Arrange mozzarella slices evenly over dough and top with sliced tomatoes. Season with salt and pepper, to taste. Sprinkle basil over pizza. Place in preheated oven and bake for 10-12 minutes or until crust is browned and cheese is bubbly. Remove pizza from oven and drizzle with balsamic glaze. Cut into slices and serve warm. Loving the simplicity of this pizza. Looks lovely! I’m so eager to try your wheat dough recipe on this over-the-top delectable looking caprese pizza. Looks what I’m always hoping to order at a restaurant, but never quite get!!! The tomatoes on top are a thing of beauty. This is MY KIND of pizza. The hubs always tries to get us to order meat lovers, but if I make it at home that means I should pick the topping right? Pinned! Gorgeous!! Pass me a slice!! This may be the prettiest pizza ever. I never considered pizza to be “pretty” before this. Do you deliver? 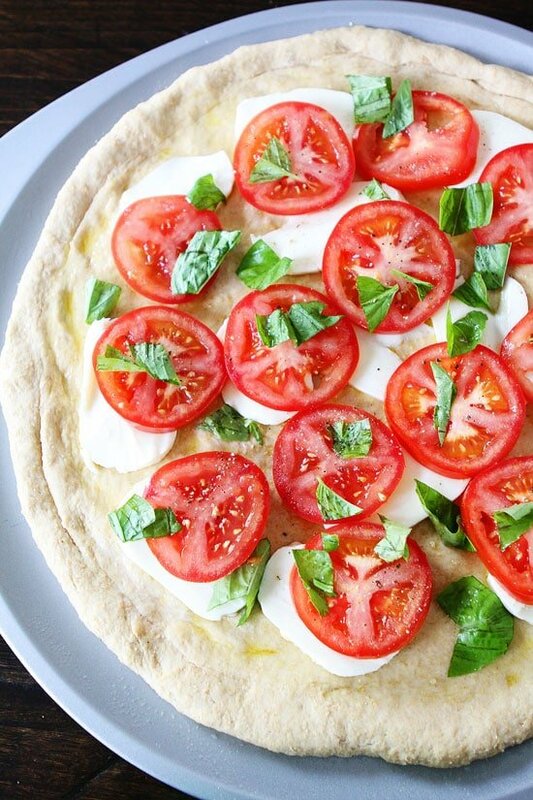 there is nothing better than a pizza with fresh tomatoes and mozzarella! I need a whole pizza all to myself, this is right up my alley! Another beautiful pizza recipe! 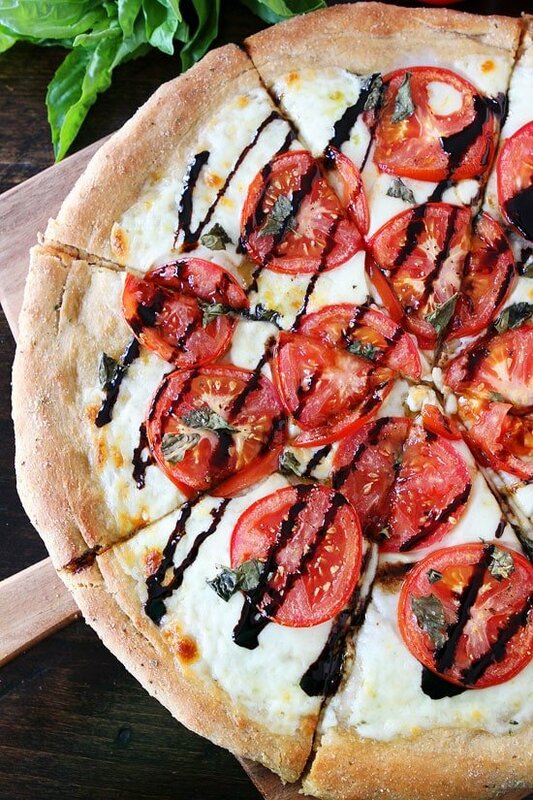 I love incorporating seasonal ingredients in our dinners and will have to try this… The balsamic glaze looks like the perfect topping for this Caprese pizza. Thanks for the inspiration for dinner tonight. I need to know what I did wrong though. My pizza had so much liquid in the center it made the crust all soggy. Perhaps I needed to drain the tomatoes or was it the fresh mozzarella? Has that ever happened to you? Any thoughts? Otherwise it was delicious!! Caprese is my favorite! This looks fabulous! I know this tastes good, but I was bowled over by how really beautiful it is. Very eye catching! My family would love this pizza! One of my favorite pizzas! I have to check out your pizza dough recipe too, I’m a big fan o pizza and if I can make it any healthier, it’s totally a plus. Yum! This looks like my kind of pizza! One of my most favorite pizzas of all time! YUM! I love making homemade pizzas – I have a balsamic glaze I got from Eataly a few months ago and I use it on everything! Are we supposed to put the pizza directly onto the oven rack or do we need to put it on a baking sheet? We use a pizza pan! Anyone know how many ww points this would be per serving? Hi Maria, this looks good! If I use your wheat pizza dough recipe, how long do I bake it? That recipe says 16-20 mins at 450 F, and this Caprese pizza says 10-12 mins at 450 F. Should I pre-bake the crust for a few mins? Do you know the nutritional info for this?? I would so appreciate it! That caprese pizza looks delicious! I love cooking for my family, and I’m always interested in trying new recipes! They love pizza, so this is a good recipe to start with! I don’t have any mozzarella cheese; do you think I can use cheddar as an alternative? I tried making this pizza and the mozzarella produced so much liquid as it melted that the crust became mushy. My kids still loved it, but what did I do wrong? Should I use a different kind of mozzarella? This turned out to be a soggy mess. If I make this again, I will bake the crust with some mozzarella in advance, then add tomatoes – with most of the water removed – and the rest of the toppings for long enough to heat through.